International exhibition INSIDE (ARTE E CIENCIA) Cordoaria Nacional, Lisbon, Portugal, featuring artists interacting with science, artificial intelligence and robotics, curated by artist Leonel Moura and featuring the work of Bill Vorn, Carl Pisaturo, Catherine Chalmers, Driessens & Verstappen, Eduardo Kac, Ken Goldberg, Marta Menezes, Miguel Chevalier, Oron Catts, Philip Ross, Roman Kirschner, Stelarc, Suzanne Anker, Orlan. The project was commissioned by the Art and Science Research Centre at UAL (ARTAKT) to mark the renovation of the Royal Institution of Great Britain. 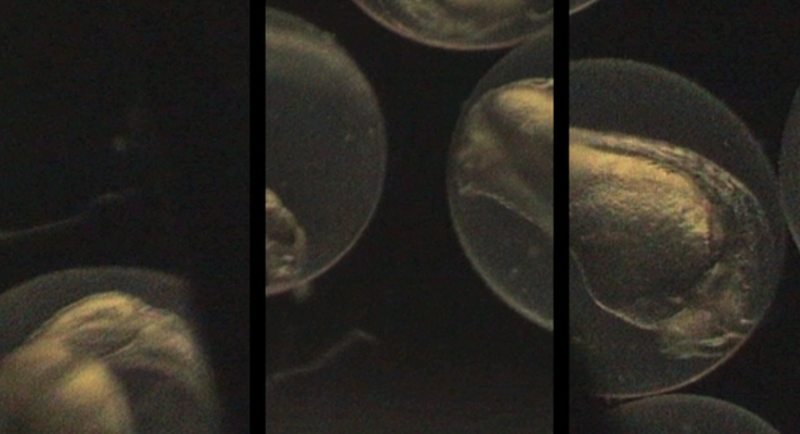 It developed from my work in zebrafish genomic research labs in London, Zurich and the Netherlands, alongside researchers from the fields of developmental biology and molecular science. 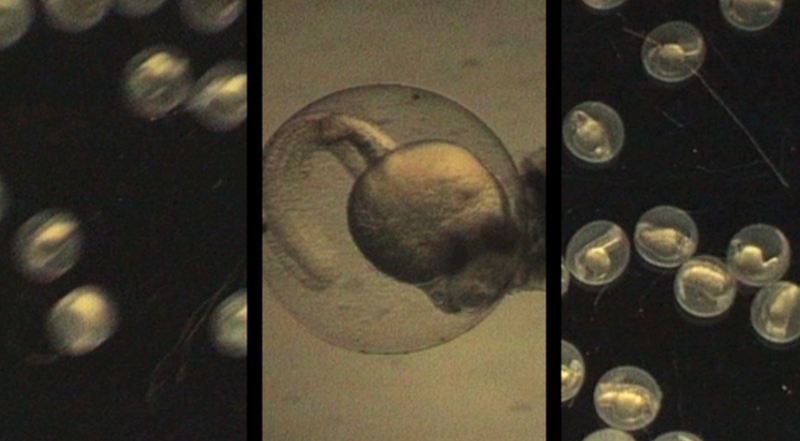 The process that formed the basis for Cocoon involved the licensed ethical acquisition of genetically mutated zebrafish embryos, and the design and building of a bespoke video-adapted light microscope recording set-up to capture 24 hours of real-time in-vitro development. 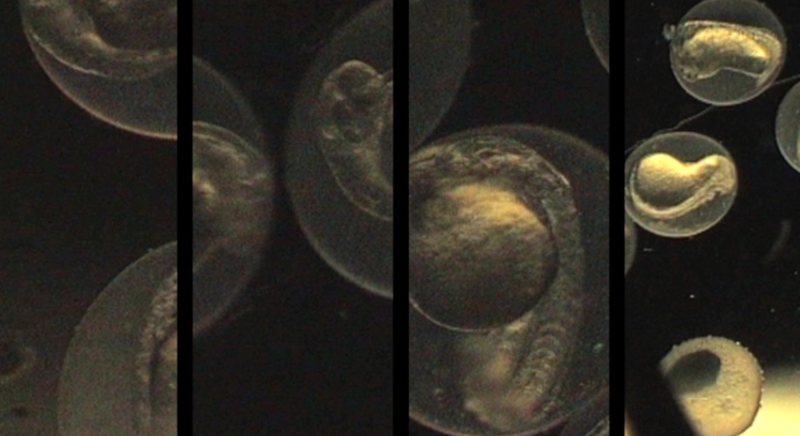 Visual recordings of the zebrafish’s developmental stages provided a unique way of presenting their ephemeral utility and mortality. I aimed to explore the artistic and aesthetic uses of microscopy in a haptic work, heightening the embodied sensual experience of visual probing and analysis. Genetic researchers in developmental biology study the co-ordination, spontaneous interactions, patterns and movements of cells as they occur in real time in all directions simultaneously. These architectures of life and death are called fate maps. In Cocoon, I allude to these fate maps as immersive liquid-like cascades of sensual living patterns. The pulses and patterns of the embryos encased in womb-like membranes are scaled up and cut vertically like a kinetic jigsaw puzzle. The highly choreographed pattern construction of the work engages the viewer in visceral and metaphorical landscapes that reference human anatomy and gene selection methods in transgenic research. Methods of physical contact with fragile, genetically altered embryonic life forms are generally hidden from public view. My research is intended to raise questions about what it means when living organisms become artefacts under human control and manipulation. Cocoon was created in the context of such questions within current scientific epistemology, where the moral status of human and non-human life in biotechnological research is being addressed. Cocoon was publically commissioned and curated by Dr.Christine Albano, for ARTAKT at Central St Martins Art and Science Research Centre UAL. Scientific Advisors for the project were: Prof Richard Ashcroft (Queen Mary College), Dr Chris Mason (Stem Cell + Regenerative Medicine Bioprocess Group, UCL) and Prof Sarah Franklin (Bios Centre, London School of Economics).